This article is written by The Cleantech Initiative. According to the International Energy Association’s (IEA) 2014 report, buildings consume more than one third of the energy and half of the electricity consumed globally, while generating one-third of global carbon emissions. Furthermore, considering the expected increase of the world population by 2.5bn people by 2050, buildings’ energy consumption will pressurize even more the global energy system. Thus, the sustainability transition will not succeed without ambitious energy efficiency goals for the residential and commercial building industry, which represents 53% of estimated potential energy savings globally by 2020, followed by transportation (24%) and the manufacturing industry (23%). Significant progresses have been witnessed as global investments in energy efficiency across all sectors increased by +9% y-o-y in 2016. Out of the $231bn invested in energy efficiency in 2016 globally, $133bn were allocated to the building sector, of which ~50% were invested in building envelope solutions. 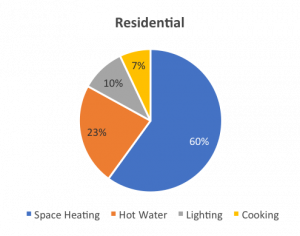 “Heating respectively represents 60% and 50% of residential and commercial buildings’ energy consumption. Thermal insulation plays a key role in the building energy consumption rationalization, along with other macro and micro-scale design factors such as building form, orientation and massing, landscaping, ventilation, passive solar design, thermal mass, and glazing technologies. While increasing renewable sources in the global energy mix, significantly reducing our energy needs through building materials’ carbon footprint optimization and improved energy efficiency capabilities will foster the sustainability transition. Thus, the building industry needs to i) design materials which minimize heat loss and maximize energy efficiency and ii) implement sustainable insulation product manufacturing processes from both a product composition and supply chain process standpoint. Insulation is maximized via the use of low density materials with complex solid paths and with either cellular or fibrous structure of trapped gas pockets which reduce heat conduction. Building insulation can reduce heating / cooling costs by up to 10 times compared to a standard building, and organic natural fibrous or cellular insulation materials add a positive carbon footprint impact to the economic rationale. According to the “World Green Building Trends 2016” survey by Dodge Data Analytic, bio-sourced / natural fibers insulation represents only 5% of the building insulation market versus 55% and 40% for the minerals and synthetic insulators, respectively. According to this survey, the insulation market will continue to grow by 3 to 5% during the next decades. By showing a double-digit growth, the natural fibers market will tend to get a bigger and bigger market share and may in the future progressively replace most of other insulators. The current market share is historical and is due to the fact that synthetic and mineral insulation materials remain among the cheapest insulation materials with a rather good thermal efficiency (l). As it is visible on the below table, for an equivalent or even better measured thermal efficiency, their cost can be discounted down to 50%. Bio-sourced / natural fibers insulation represents only 5% of the building insulation market versus 55% and 40% for the minerals and synthetic insulators, respectively. However, this thermal efficiency characteristic needs to be considered carefully. The l is measured at the end of the production line. If you measure it again after a few years, especially in case of humid conditions for mineral insulators, the thermal efficiency will be significantly deteriorated while bio-sourced fibers will remain very stable either from a dimensional size or standpoint. Another important consideration is the ability to protect not only against cold but also against summer heating, which is measured in “phase shift”. The phase shift is the time it takes for the heat to penetrate inside the habitat. This often enables avoiding the use of air conditioning , especially environmentally expensive. For an excellent summer comfort, besides the insulating power, it is important to consider the Technical Indicators of materials and insulators for the specific construction of insulating materials. The higher the value, the more heat the material can absorb, thus preserving the freshness inside the home for a longer period. For a wood wool or for GRAMITHERM (an innovative natural fiber insulation material made of meadow grass and on which we will focus in this article) the measure is approximately 11 hours. For a mineral fiber or a synthetic insulator, it is 4 – 7 hours, meaning that the heat will take 11 hours to cross the GRAMITHERM insulation in one case and only 7 hours in the case of mineral fibers / synthetic insulator. As an example, if the sun heats the roof starting at 10am, the natural insulation will not let the calories go through before 9pm. By then the night will have fallen, and the radiation will have ceased. As a result, the natural fiber prevents solar radiation and provides an optimized summer comfort without using a cooling system. Some other qualities such as phonic absorption or ease of laying without protection masks also influence the choice of one type of insulator over another. Additionally, as a result of the increasing awareness of the climate global warming, the insulation market evolution is going to be also driven by ecologic considerations including carbon footprint, recyclability, health impact and exhaustion of raw material criteria. In terms of carbon footprint, synthetic insulators have the worst balance sheet with an average of 6.5 kg emission per kg of product, with 0,93 kg/kg rejection for mineral wools, while natural fibers have a positive climate impact by absorbing 0.1 kg of CO2 per kg of product on average. Another critical ecological issue is the recyclability, where again the negative impact of synthetic materials with an average time to degrade of over 500 years is deeply unsustainable. Mineral wools are also difficult to recycle due to a recycling cost higher than the cost of new product manufacturing. This is not the case of natural fibers which have the virtue to be naturally and fully recyclable. Natural insulators are generally harmless to the health, as long as they do not release any recognized toxic compounds, and therefore help fight indoor air pollution. Nevertheless, these insulators must undergo some additional treatments, especially to protect them from rodents or make them fireproof. Finally, one of the major interest of bio-sourced products is their renewable nature. If everyone lived like Australians, we would need 5.2 planets. If we lived like Americans, 5 planets would be needed. If the rest of the world lived like France, we would need 3 planets. By performing a world average, we would need 1.7 planet. Only renewable raw materials can be considered as an inexhaustible source provided they are not exploited at a faster rate than their natural regeneration. 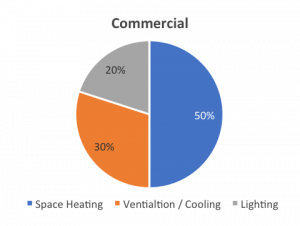 Manufacturing durable high-quality building envelope elements combining high insulation characteristics, high air-tightness and fast erection speed is an increasing trend spanning across the building industry. However, it remains critical to design or renovate buildings targeting low thermal losses and to choose insulation products best fitting the applications and with a long-term perspective (i.e. using an overall lifecycle methodology). 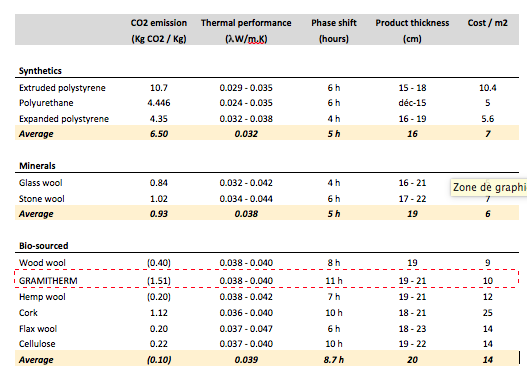 Although minerals appear to provide the optimal selling price / carbon footprint ratio, glass wool and stone wool remain net emitters of CO2 (see table below). The optimal solution needs to be economically viable compared to competing options, feature insulation characteristics complying with industry standards, and to also represent the most sustainable solution. GRAMITHERM® is an innovative bio-sourced insulation material providing the best carbon footprint among its green insulation competitors, using an abundant and underutilized raw material: meadow grass, while also being one of the most competitive price options in the bio-sourced insulation market. The industrial process to manufacture GRAMITHERM® does not produce waste and requires limited external energy sources, making it an ideal fit to the circular economy. According to a life cycle analysis performed by the University of Zurich in 2015, manufacturing 1kg of GRAMITHERM® results in an absorption of 1.405kg of CO2. The family of grasses covers a quarter of all land on earth, making it the most abundant material available. Meadows cover ~20% of the European territory. Thus, grass appears to be one of the most abundant biomass resource while also being one of the most underutilized. Unlike hemp or flax, grass does not need dedicated farmland and today has too few successful and profitable industrial applications. It is also one of the most competitively priced bio-sourced insulation products, with a price tag of €10/m2. Only wood wool, which is already produced in large quantities, can be more aggressive on pricing, with an average of €8-10/m2. However, unlike wood wool, the installation of GRAMITHERM® is dust free. GRAMITHERM® also provides all necessary technical features and benefits a proper insulation material should, including thermal insulation against cold winter and summer heating, mold & fire resistance, allergy prevention (no pollen, fine particles or fungal spores), acoustic absorption, humidity regulation, dimensional stability, rodent proof (digestible parts separated from fibers during the manufacturing process) as well as other health benefits during material handling. GRAMITHERM® can be used to insulate parts of new and renovated buildings located under the roof and between the rafters, for the doubling of the external walls and internal partitions, in addition to a wood frame as well as the floors and ceilings. Its exceptional ability to absorb moisture from the surrounding air and to release it when the ambient air becomes drier gives a lot of comfort. This property makes GRAMITHERM® one of the top performing insulators in subtropical regions where synthetic & mineral products are excluded. In addition to be a green alternative to the insulation market with competitive technical and pricing characteristics, GRAMITHERM® also provides a positive carbon footprint impact spanned over its entire life cycle. 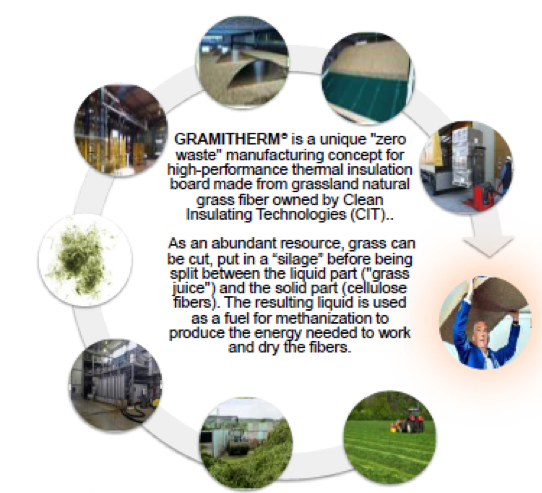 Furthermore, the availability of unexploited grass will allow to produce GRAMITHERM® everywhere all over the world, providing a competitive bio-sourced insulation solution. Synthetics include extruded polystyrene, polyurethane and expanded polystyrene; minerals include glass wool, stone wool and excludes cellular glass and vermiculite; bio-sourced include wood wool, GRAMITHERM, hemp wool, cork, flax wool and cellulose. You’d like to discover more solutions about the Energy Transition ? Join our mobilization Energies for Climate !